Martin takes readers on an eight-week journey through the Psalms--the prayers, desires, hymns, insights, and observations of some of God's choice servants--and shows readers how to get to know God through this pilgrimage. - Publisher Live life as a pilgrim on God's adventure. Do you want to find your home in God now while waiting to reach your grand destination-heaven? 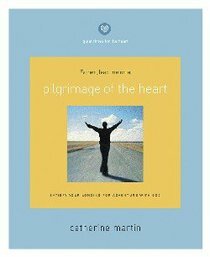 In Pilgrimage of the Heart, author Catherine Martin takes you on an eight-week daily journey through the Psalms, the prayers, desires, hymns, insights, and observations of some of God's choice servants. Because many of the Psalms are prayers, we learn to pray Because the Psalms are written records, we learn to journal Because the Psalms are meditations of Scripture, we learn to meditate Because many Psalms are a result of silence before God, we learn to be still and know that He is God Written across the pages of Scripture is a great invitation: the call of the majestic God of love to His beloved to come away with Him, dwell with Him, commune with Him, and delight in Him. Spend time getting to know God on a pilgrimage in the Psalms. "Blessed are those whose strength is in you, who have set their hearts on pilgrimage." -Psalm 84:5 NIV The QUIET TIMES FOR THE HEART series presents revolutionary daily quiet times of devotion that will encourage you in your time alone with God, including helpful devotional reading, Bible study, journaling, prayer, worship, meditating on hymns, and application of the Bible to your life. About "Quiet Times For the Heart: Pilgrimage of the Heart"
Live life as a pilgrim on God's adventure. Do you want to find your home in God now while waiting to reach your grand destination-heaven? In Pilgrimage of the Heart, author Catherine Martin takes you on an eight-week daily journey through the Psalms, the prayers, desires, hymns, insights, and observations of some of God's choice servants. Because many of the Psalms are prayers, we learn to pray Because the Psalms are written records, we learn to journal Because the Psalms are meditations of Scripture, we learn to meditate Because many Psalms are a result of silence before God, we learn to be still and know that He is God Written across the pages of Scripture is a great invitation: the call of the majestic God of love to His beloved to come away with Him, dwell with Him, commune with Him, and delight in Him. Spend time getting to know God on a pilgrimage in the Psalms. "Blessed are those whose strength is in you, who have set their hearts on pilgrimage." -Psalm 84:5 NIV The QUIET TIMES FOR THE HEART series presents revolutionary daily quiet times of devotion that will encourage you in your time alone with God, including helpful devotional reading, Bible study, journaling, prayer, worship, meditating on hymns, and application of the Bible to your life.